'Tis the season for re-releases! 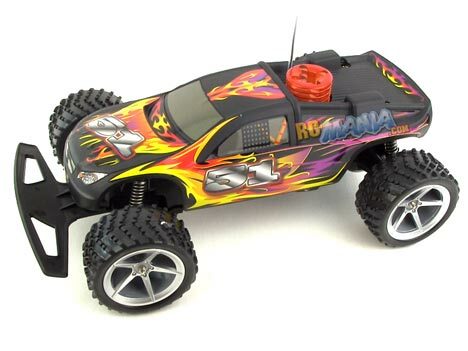 If you've followed RC Mania for a looooong time, you surely remember the Fast Lane Nitro Power truck I reviewed in 2009. Well, lookie here, it's back! Except for a few very minor details, this here appears to be the exact same thing, and that could be very good, as the original got good marks from me. This is a roughly 1/12th scale two-wheel-drive open-wheel truck that comes with all batteries included, featuring a fairly standard 9.6V rechargeable battery for the vehicle itself. Because it's a common type of battery, you can get cheap spares from generic manufacturers on Amazon or eBay pretty easily, greatly extending the play time. Not all things that look the same on the surface are identical underneath, though, so let's see how the new version stacks up. Whew! Thankfully the Fast Lane RC Nitro Power truck of 2012 (also sold under the Dickie brand in some countries) is the same vehicle it was three years ago. Still very fast and very agile, and capable of driving over a range of reasonable off-road surfaces. Without referring back to my original review, I decided to give this truck an 'A' rating based upon its current performance and value. Looking back to what I wrote before, I see I gave it an A-. That's fine & all, and it's pointless to change the old archived page, but I'm happy with where I stand on this truck today. It could still use softer tires and springs, but it's still one of the best deals in the contemporary toy-grade RC market.